where I(l,m) is the sky surface brightness, ηi is the sensitivity and Tis is the system temperature of the antenna i in units of Kelvin/Jy and Kelvin respectively, ϵij is the additive noise on the baseline i-j, and ϕi is the antenna based phase of the signal. The rest of the symbols have the usual meaning. In practice, however, the antenna based amplitude ( ) and phase (ϕi) are potentially time varying quantities. This could be due to changes in the ionosphere, temperature variations, ground pick up, antenna blockage, noise pick up by various electronic components, background temperature, etc. Treating the quantities under the square root in the above equation as the antenna dependent amplitude gains, these can be written as complex gains gi = aie-ιϕi where ai = . For an unresolved source at the phase tracking center, variations in this amplitude will be indistinguishable from a variations in the ratio of η and Ts. The use of the word “antenna based gains” for gis result in confusion for many and needs some clarifications. gis are called complex “gains” since they multiply with the complex quantity ρij. For an unresolved source, represents the fraction of correlated signal and arg(gi) represents the phase of the correlated part of the signal from the antenna with respect to the phase reference (usually the reference antenna). It is in this sense that it is referred to as “antenna based” gains. However, as defined here, they include Ts which in turn includes the sky background temperature. They are therefore a function of direction in the sky. However, here we assume that the angular scale over which gis vary is larger than the antenna primary beam (isoplanatic case). For an unresolved source at the phase tracking center, all terms in the exponent of ρij∘ are exactly zero. ρij∘ in this case would be proportional to the flux density of the source. If ρij∘ represents the structure of the source accurately, Xij will have no source dependent terms and is purely a product of the two antenna dependent complex gains. This can also be derived by equating the partial derivatives of S with respect to real and imaginary parts of gi as shown in Section D.3. Since the antenna dependent complex gains also appear on the right-hand side of Equation D.8, it has to be solved iteratively starting with some initial guess for gjs or initializing them all to 1. (the change in S from one iteration to another) where δ is the tolerance limit. Equation D.8 offers itself for some intuitive understanding in the following way. Xij is a product of two complex numbers, namely gi and gj⋆, which we wish to determine. Xij is itself derived from the measured quantity V ijObs. Numerically speaking, each term in the summation of the numerator of Equation D.8 will involve gi (via Xij) and the multiplication of Xij with gjwij would give gi an effective weight of 2wij. 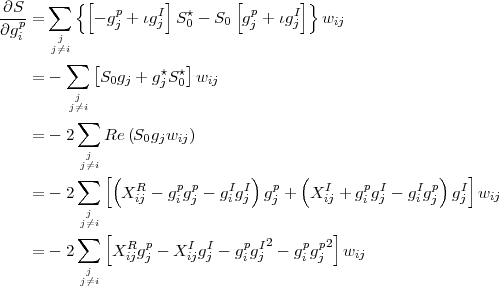 Since the denominator is the sum of this effective weight, the right-hand side of Equation D.8 can be interpreted as the weighted average of gi over all correlations with antenna i. In the very first iteration, when gj = (1,0), the normalization would be incorrect since the numeric value of gj, as it appears inside Xij would be different from that used in the denominator of Equation D.8. However, as the estimates of gjs improve with iterations, the equation would progressively approach a true weighted average equation. The speed of convergence will depend upon the value of α and the convergence would be defined by the constraint in Equation D.10. In the ideal case when the true value of all gis is known, right hand side of Equation D.8 also reduces of gi. Estimating gi for an antenna, by averaging over the measurements from all baselines in which it participates (for a unresolved source) makes sense since for an N element array, gi would be present in N-1 measurements (all the j=1,N;j≠i) and the best estimate of gi would be the weighted average of all these measurements. Proper weight for gi, buried in each of the products Xij, can be found heuristically as follows. gi, estimated from the measurements of a given baseline, must obviously be weighted by the signal-to-noise ratio on that baseline. This is wij in the above equations. It must also be weighted by the amplitude gain of the other antenna making the baseline, namely gj, to account for variation in antenna sensitivities and Ts. The total weight for gi would then be 2wij, the sum of which appears in the denominator of Equation D.8. Knowing that ideally Xij = gigj⋆, each of the j=1,N must be multiplied by gjwij (to apply the the above mentioned weights to gi), before being summed for all values of j and normalized by the sum of weights to form the weighted average of gi. One thus arrives at Equation D.8 using these heuristic arguments. Hence, knowing ηi, Tis can be estimated from the amplitude of the antenna dependent complex gains. All contributions to ρijObs, which cannot be factored into antenna dependent gains, will result in the reduction of . η remaining constant, this will be indistinguishable from an increase in the effective system temperature. Since majority of later processing of interferometry data for mapping (primary calibration, bandpass calibration, SelfCal, etc.) is done by treating the visibility as a product of two antenna based numbers, this is the effective system temperature which will determine the noise in the final map (though, as a final step in the mapping process, baseline based calibration can possibly improve the noise in the map). In the normal case of no significant baseline based terms (ϵij) in Xij, the system temperature as measured by the above method will be equivalent to any other determination of Tis. where giON and giOFF are the antenna dependent gains with and without the noise source of temperature Tn. Note that ηi does not enter this equation. Also, Tn should be such that ≥ 0.1 to ensure that the correlated signal is measured with sufficient signal-to-noise ratio. For example, for P-band, a calibrator with P-band flux density > 5 Jy must be used. gis are complex functions. One can therefore write S in terms of giI and gip, the real and imaginary parts of gi and minimize with respect to giI and gip separately. It is shown here that the complex arithmetic achieves exactly this and the results are same as that given by complex calculus. The superscripts I and R in the following are used to represent the real and imaginary parts of complex quantities. 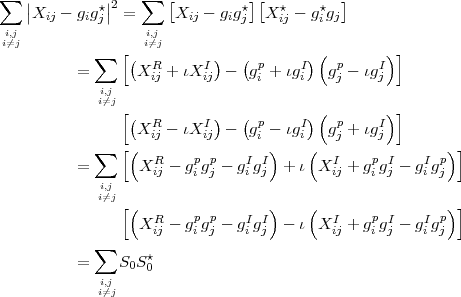 This is same as Equation D.8, which was arrived at by evaluating a complex derivative of Equation D.5 as ∂S∕∂gi⋆, treating gi and gI⋆ as independent variables. Evaluating ∂S ∂gi = 0 would give the complex conjugate of Equation D.21. Hence, ∂S∕∂gi gives no independent information not present in ∂S∕∂gi⋆.